Put all the meatball ingredients in a large bowl. Break up the meat and mix everything together with your fingertips, making sure to distribute everything evenly, without compacting the meat too much. Form the mixture into two large meatballs. Heat olive oil in a skillet until hot, and brown the meatballs on all sides. To finish cooking the meatballs, I put them in a small oven safe pot and cover with the marinara sauce. Cover loosely with foil and bake for about 30-40 minutes until the meat is cooked through. A thermometer inserted i the center of a meatball should read 160F. 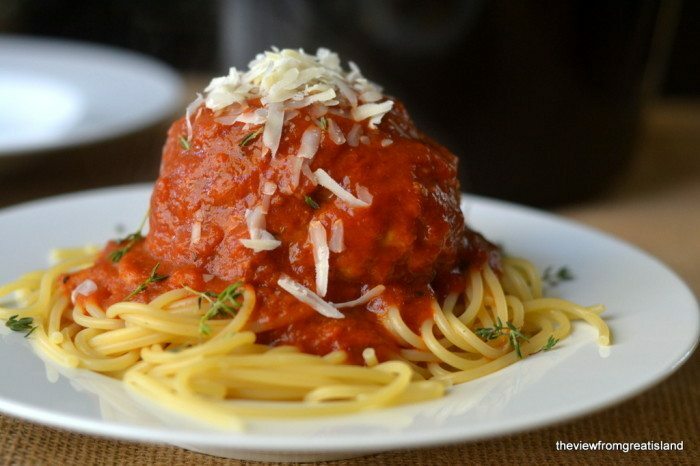 Serve over spaghetti, garnished with Parmesan cheese.